A woman holds a photo of Ezell Ford during a police commissioner meeting on his shooting death on Tuesday, June 5, 2015. 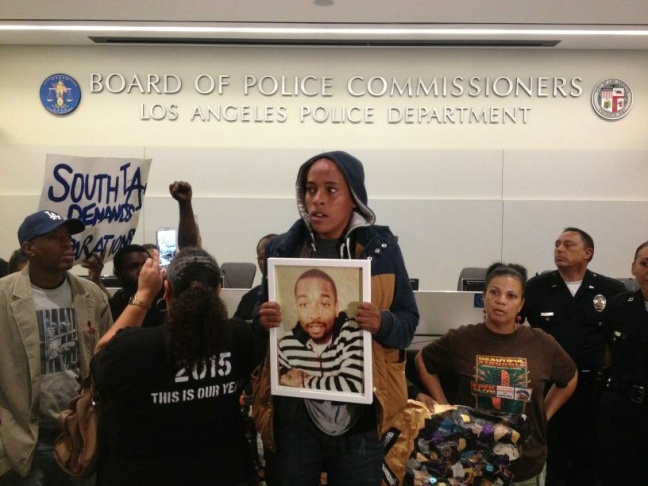 A heavy police presence was on hand for the Los Angeles Police Commission's hearing into the shooting death of 25-year-old Ezell Ford on Tuesday, June 9, 2015. Protester Evan Bunch was dragged out of the Los Angeles Police headquarters during a police commissioner meeting on the shooting death of Ezell Ford on Tuesday, June 5, 2015. 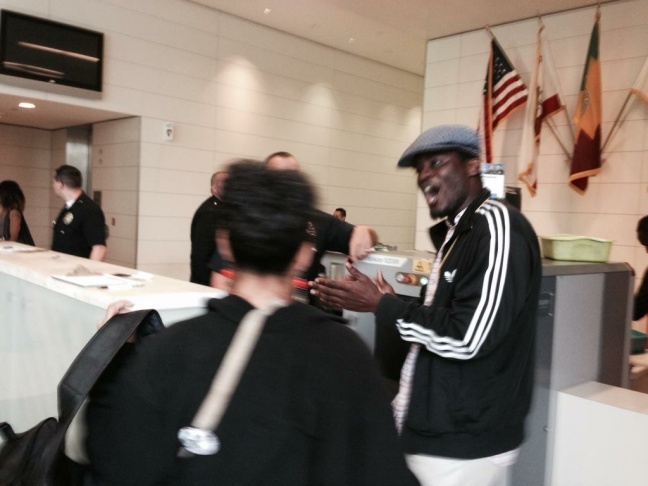 Protestor Evan Bunch singing his way through security earlier in the day heading into the #EzellFord hearing on Tuesday, June 5, 2015. 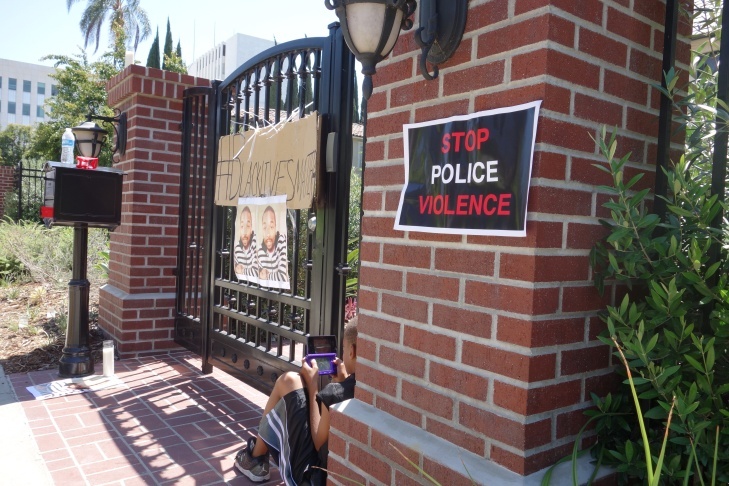 A boy plays a video game outside the locked gates of Mayor Eric Garcetti¹s official residence Sunday, June 7, 2015. Posters attached to the gate commemorate Ezell Ford, who was killed by police in August. 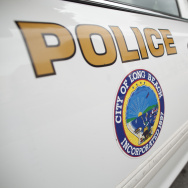 The Los Angeles Board of Police Commissioners ruled Tuesday on the LAPD officers involved in the shooting death of Ezell Ford, an unarmed mentally ill black man. One officer was found to have acted out of departmental policy; the other acted mostly within policy, the LAPC found. Earlier, an overflow crowd was in attendance at the commission headquarters, chanting "black lives matter" and "shame on you." One person in attendance, Evan Bunch, who had been singing in the security line earlier in the morning, was dragged out of the building and arrested by police. The meeting was temporarily halted after commissioners warned the public they would adjourn if people grew unruly. Ford, 25, died of several gunshot wounds during an "administrative stop" in the Florence neighborhood of South L.A. last year. 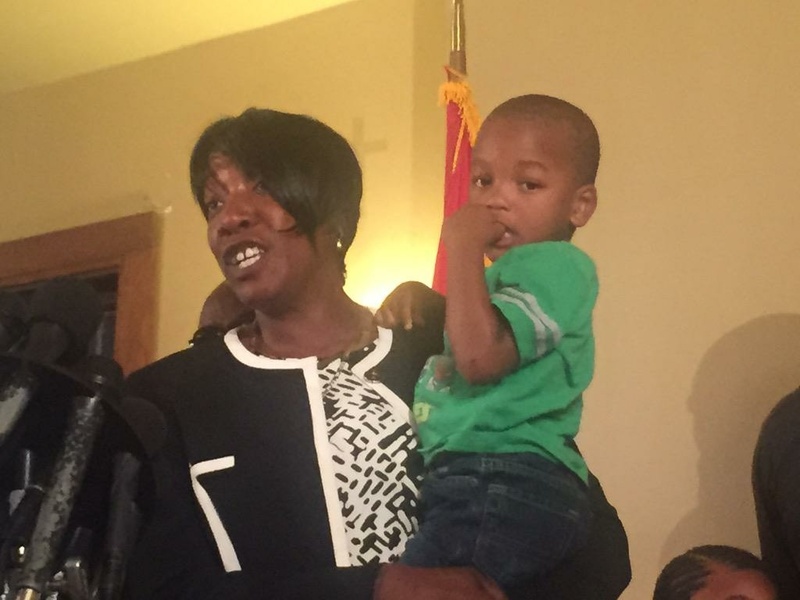 9:07 p.m.: Ezell Ford's mother thanks police commission, slams Chief Beck, D.A. Addressing reporters from the First AME Church in South Los Angeles, the mother of the 25-year-old man shot down by Los Angeles police last August said she was satisfied with the police commission's ruling Tuesday. "I agree totally with their decision," said Tritobia Ford of the Los Angeles Police Commission ruling Tuesday Commissioners found one of the LAPD officers involved in the shooting death of her son Ezell was operating outside of department policy. "My initial reaction was 'Hallelujah,'" she said. Commissioners found the other officer had acted mostly within policy. Tritobia Ford said she felt some compassion from LAPC President Steve Soboroff when he read the results of their probe into the shooting. Federico Castelan Sayre, an attorney representing the Ford family in a federal civil rights case against the two LAPD officers involved in the shooting, said he was surprised by the commission's findings. An investigation from Chief Charlie Beck found both officers were justified in the shooting. "I think it was extraordinary and that it was so sweeping," said Castelan Sayre. He acknowledged it was not unprecedented for a police commission to disagree with a police chief's findings. 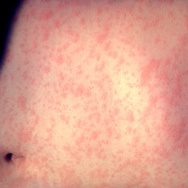 "This may add some impetus top the case that wasn't there before," said Castelan Sayre. Tritobia Ford and her lawyer both said it would now be up to Los Angeles District Attorney to issue any criminal charges against the officers involved. "District Attorney Jackie Lacey, you need to step up," said Ford. "We haven't heard from you. Where are you?" With the investigations from the LAPD, the Inspector General and the police commission now concluded, Chief Charlie Beck is also tasked with deciding on punishments for the officers involved, if any. Chief Beck did not talk to reporters on Tuesday. Evoking memories of unrest seen in Los Angeles in 1965 and 1992, Mayor Eric Garcetti on Tuesday night gave his condolences to the family of Ezell Ford, the 25-year-old black man shot by two Los Angeles police officers in South L.A. last year, and thanked the L.A. Police Commission for their work in reaching a decision in their assessment of the shooting. 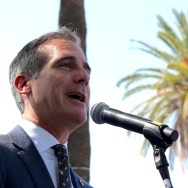 "Today, the system worked as it is supposed to," Garcetti told reporters. The Los Angeles Police Board of Commissioners announced earlier they had found one of the officers involved in the August 2014 shooting had acted outside of departmental policy. The other officer was found to have acted mostly within policy. He took time to address the family of Ezell Ford, with whom he met at the AME church in South L.A. after the police commission announced its findings. "Ezell was my constituent," Garcetti told reporters. "Mr. and Mrs. Ford are my constituents, and the pain they have gone through is something no parent should ever have to experience." The mayor took the opportunity to highlight some of the work the LAPD has been doing to create better ties with the community, including programs to keep neighborhoods safe and "LAPD University," where rookie officers revisit some of their initial training. The LAPD's investigation into the Ford shooting found the officers were justified in their actions, contradicting the commission's findings. Garcetti acknowledged that disparity, saying it was not uncommon for police commissioners to disagree with a police chief. Chief Charlie Beck will have a final say as to the punishments, if any, the officers involved will face. Calling the shooting of Ezell Ford a tragedy, Los Angeles Police Commission President Steve Soboroff on Tuesday announced that the five-member board ruled that one of LAPD officers involved in the shooting death of 25 year-old Ezell Ford acted out of departmental policy; the other officer acted mostly within policy, excepting the first drawing of his weapon. Ford, an African-American man who was unarmed, was killed by the officers last August during an “administrative stop” after he allegedly attempted to grab one of the officer’s guns. Demonstrators with Black Live Matters Los Angeles and other community groups have been calling for L.A.'s mayor to fire Chief Charlie Beck. Beck will ultimately decide the disciplinary action, if any, against the officers involved. 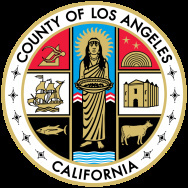 L.A. Mayor Eric Garcetti was expected to hold a press conference regarding the commission's findings Tuesday evening. The commission split its decision in the following manner. Because officer names are not released as part of the investigation, it's not clear which officer is which. Several dozen police officers are staffing the metal-barricaded plaza at LAPD Headquarters on 1st Street across from City Hall. Many carried helmets in addition to their usual police batons and patrol gear. They didn't wear the helmets, though. They were discreetly stowed on the ground. In anticipation of possible protests that might occur after the Los Angeles Police Commission comes back with its ruling on the officers involved in the shooting death of Ezell Ford, the majority of the department's police units were asked Tuesday to go to work in uniform, an officer with LAPD media relations told KPCC. That includes officers who normally wear suits or street clothes to work, such as detectives. 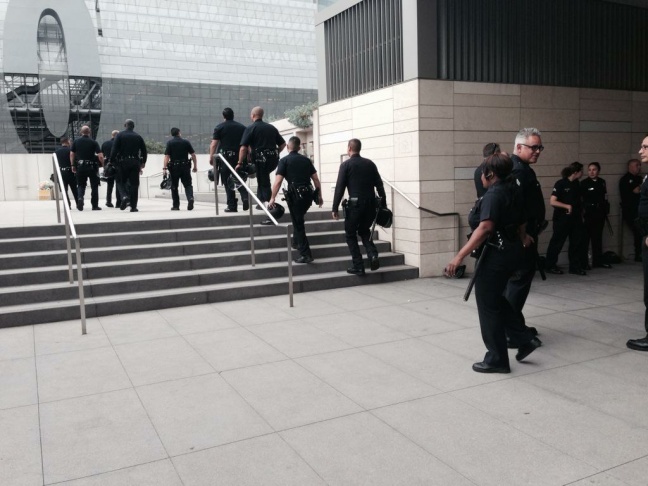 Earlier in the day, barricades were seen lining the front of LAPD headquarters in Downtown L.A. The public comment period has ended and the Los Angeles Board of Police Commissioners has gone into closed session, where they will consider whether to clear the two officers in the fatal shooting of Ezell Ford. The board is expected to announce their decision following a vote behind closed doors. Tritobia Ford, Ezell's mother, addressed the police commission, speaking first to LAPD Inspector General Alex Bustamante — who reportedly found in his report that the officers were justified — and then to Steve Soboroff, the head of the police commission. "Mr. Bustamonte, you said that you questioned the tactics of the officers, but yet you cleared them. That is definitely a conflict. How can they not have a reason to stop him, but yet you clear them?" she said. "Mr. Soboroff, I saw you on the news and you said that we deserve fairness. I'm asking you — I'm begging you — please, please, my son would never grab for no gun. He wanted to live." Members of the public packed the room Tuesday to observe and be heard as the commission prepared to vote on whether to clear the two LAPD officers involved in the shooting death of Ezell Ford. Omar Pine said, "As an Angeleno, this is appalling. The world is watching us… This is serious. We're not here just to make your day bad. We're here to show you that black lives do matter." 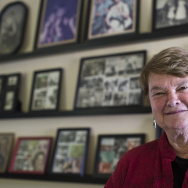 Kathleeen Wells, host of KCAA radio, said, "When I came in here, I was shocked to see that they're all mostly white men on a commission assessing, analyzing, judging the black community. That's the problem right there... You cannot judge our community because your point of view is skewed." Police commissioners have resumed the public hearing portion of this morning's meeting at Los Angeles Police headquarters Tuesday. The meeting was briefly halted and authorities cleared the room after a speaker refused to adhere to a the 2-minute limit for public comment. Members of the Los Angeles Board of Police Commissioners have halted a meeting at which they were expected to rule on whether to clear two LAPD officers of wrongdoing in the fatal shooting of Ezell Ford. 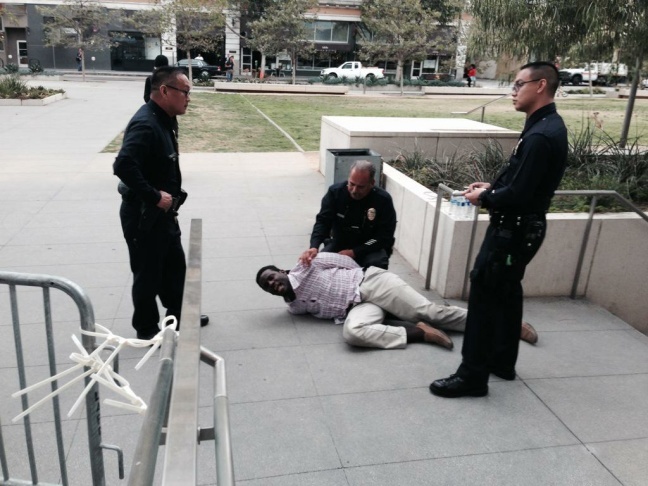 A man who had been singing in the security line ahead of a meeting of the police commission was stopped by police and dragged across the marble floor of the building, KPCC's Sharon McNary has reported. McNary was speaking with Take Two host Alex Cohen when she witnessed police attempting to pull Evan Bunch outside. Officers could be heard in the background saying, "Please stand up, sir!" McNary said Bunch was refusing to stand. McNary said Bunch was dragged from the building down a ramp and then back inside to be arrested. A live stream from someone inside the commissioners' meeting just minutes earlier was shut down shortly after one of the commissioners could be heard warning people in attendance the meeting would adjourn if participants were unruly. The meeting opened with a public comment period on Tuesday morning ahead of an expected decision on whether to clear two LAPD officers of wrongdoing in the fatal shooting of Ezell Ford. The meeting was packed with attendees, according to McNary. The main room, which can hold about 100 people, is completely full, and an overflow room with video and a place for people to publicly speak has about 25 people, McNary reported. Several activist organizations that have developed in Los Angeles to address the relationship of the LAPD and the African-American community are represented at the meeting. They include the Youth Justice Coalition, L.A. Community Action Network, the Black Community Clergy and Labor Alliance, the somewhat more recent group Black Lives Matter, McNary said. All are there, they say, to make sure their opinions are expressed to the board. Members of the public have begun making comments as the Los Angeles Board of Commissioners meeting gets under way. The commissioners are scheduled to rule today on whether to clear two LAPD officers of wrongdoing in the fatal shooting of Ezell Ford. KPCC reporters Frank Stoltze and Sharon McNary are reporting. Ahead of the meeting, one attendee, Evan Bunch, sang while waiting in the security line. The Los Angeles Board of Police Commissioners is scheduled to rule Tuesday on whether to clear two LAPD officers of wrongdoing in the fatal shooting of Ezell Ford, an unarmed black man whose family said he had a history of mental illness. Ford's death Aug. 11 occurred two days after the shooting of Michael Brown in Ferguson, Misssouri, focused national attention on deaths of unarmed black men at the hands of police. Ford's death has been the catalyst for repeated protests of LAPD's relationships with the communities its officers patrol. As many as two dozen demonstrators with Black Lives Matter Los Angeles have been camped out on the median strip and sidewalk outside the mayor's official residence in Hancock Park since Sunday, but they plan to leave early Tuesday to attend the commission hearing. They have been demanding the firing of Chief Charlie Beck. The Police Commission awarded Beck his second five-year term on Aug. 12, one day after Ford's death. Early Monday, Garcetti left his home by a back gate onto a parallel street, but not before several of the sidewalk sit-in participants were able to rush around and confront him on video as he was driven away. Garcetti issued a statement early Monday saying he called and left a message of condolence Sunday night with Ford's mother, Tritobia Ford. The demonstrators also want compensation for families of those killed by police, and for the Police Commission to openly deliberate on whether the Ford shooting was justified. The Commission will take comments from the public in open session beginning at 9:30 a.m., and then review the actions of Officers Sharlton Wampler and Antonio Villegas behind closed doors. The commission is required to return to open session to announce its decision. Since Ford's death, the LAPD has made several changes intended to reduce the number of violent incidents and improve relationships. The city has embarked on a $7 million annual program to outfit officers with body cameras to record their interactions with civilians. The mayor's most recent budget also called for creating a new 40-officer neighborhood policing division and also adding 200 officers to its Metro squad of quick-response officers. 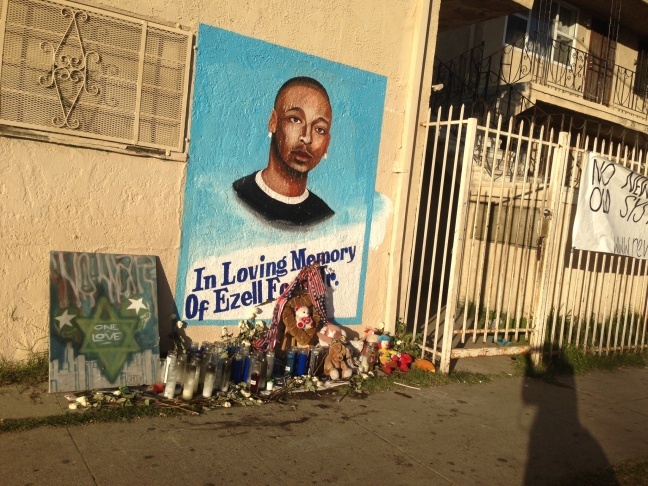 Ezell Ford grew up in the neighborhood near 66th Street and Broadway. He was a promising young athlete, but got into legal trouble over marijuana possession. In 2008, he was the victim of a gang shooting. The following year, he began showing signs of mental illness, according to his great aunt Mahalia Clark. He was a familiar presence on nearby streets because he would spend much of his days taking extended walks, often bumming cigarettes from people he knew, Clark and neighbors said. On Aug. 11, 2014 he encountered two police officers in front of a house near 65th and Broadway. There was a struggle, with Ford and another officer on the ground. Ford was shot three times. One shot hit his upper front torso, one struck behind the arm, and the third went into his back. The gun was close enough to leave a muzzle mark on his back, according to the Los Angeles County Coroner's autopsy. The shooting has been the subject of investigations at the LAPD by the chief of police and by Alex Bustamante of the independent Office of the Inspector General. The Police Commission decision is the final word on whether the officers were justified using deadly force and whether they acted within the department's use-of-force policy. The Los Angeles Times, citing unnamed sources close to the LAPD's investigation said Chief Beck found the shooting justified, as did Bustamante. The Times report said Officer Wampler had scratches on his hand and on his holster. However, Bustamante is said in the Times report to have questioned why the officers approached Ford in the manner they did. The District Attorney's office is running an independent parallel investigation that would compare its findings with the LAPD's, and decide whether any criminal charges are warranted. Ford's mother, Tritobia Ford, has said she wants the U.S. Department of Justice to also investigate the shooting. Thom Mrozek, spokesman for the U.S. Attorney's office in Los Angeles said they are monitoring local investigations.